“There was bleeding. He was still alive,” Chinese doctor Enver Tohti recalled to a panel of experts on China’s lucrative practice of organ harvesting from prisoners of conscience. Ireland’s Joint Committee on Foreign Affairs and Trade, and Defence on July 6 listened to evidence presented by organ harvesting experts, including David Matas and Ethan Gutmann, who have both been nominated for the Nobel Peace Prize for their investigative work in China. The panel listed a series of recommendations to the committee, including urging the government to ban “organ tourism”—a hugely profitable business predominantly abused by China, where citizens travel overseas where they can pay for an organ transplant. 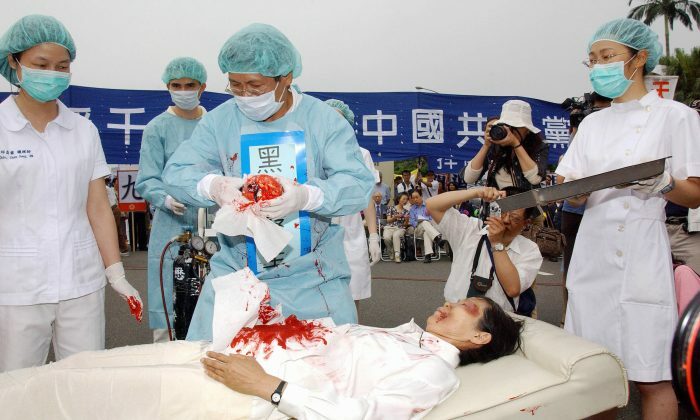 The main body of victims of these organ transplants is from practitioners of Falun Gong—a peaceful, traditional meditation practice whose main tenets are truthfulness, compassion, and tolerance. The Chinese Communist Party (CCP) launched a brutal persecution against its practitioners in 1999, which continues to this day. Hundreds of thousands of practitioners are in the vast network of labor camps across China at any one time and are highly vulnerable to being put on lists for organ extraction. Gutmann went on to say that this is a critical moment in a critical time, and now is the time to act. “Every time I give this account it seems like a confession,” he said, before talking to the committee. In 1995, he said two chief surgeons asked him to prepare a team for “the largest possible surgery” for the next morning. Tohti and his team were brought outside the hospital and told to wait for gunshots. “After gunshots were heard, we rushed in. An armed officer directed us to the far-right corner, where I can see a civilian-clothed man lying on the ground with a single bullet wound to his right chest,” Tohti said. Then he said chief surgeons ordered and guided him to extract the liver and two kidneys. “The man was alive,” he said. The wounded man tried to resist but was too weak. In most countries, once a patient is put on an organ transplant list, wait times can be months or years, depending on the type of organ. But what researchers have found is that for patients going to China, an organ can be procured within days or weeks. One of the driving factors pushing this organ tourism trade is the high demand for organs. “It is not acceptable that a normal ‘by-one-get-one-free’ shopping pattern can be seen in organ transplantation,” he said. “We suspect that the CCP is building a national database for organ trade,” he said. Uyghurs are a muslim ethnic minority also targeted for persecution by the CCP and have reportedly also been targeted for organ harvesting. Gutmann and Matas found that in China there are between “60,000 transplants to 100,000 transplants per year” in a nearly 700-page report they published last year in June.